SRAC "River, Rocks, and Time"
Spanish Hill is a large glacial mound located in South Waverly, PA. It is just 1/4 mile east of the Chemung River (the western branch of the Susquehanna above Tioga Point), and just south of Waverly, NY and the New York state border. Spanish Hill is private property - no trespassing. "Of many points of historic interest in our valley, perhaps none has attracted more attention or roused more speculation, from the earliest times to the present, than the mound called Spanish Hill. This prominence is due not only to its unusual position (isolated from the hill ranges and regions), but also to its odd outline, the remains of fortifications on the top, and its present name." - ~Louise Welles Murray -"History of Old Tioga Point and Early Athens -"1908. Now covered with “No Trespassing “ signs, a large home and several out buildings, the site was once a favorite place for locals to take the steep climb to the summit for a Sunday picnic. The earliest of these would have picnicked on a beautiful flat lawn surrounded by strange earthen walls with an interior ditch that would later be erased by the plow of an overzealous farmer. Where rising lone, old Spanish Hill appears, The post of war in ancient unknown years. And looks abroad o’er open fertile lands. In 1878 Spanish Hill landowner, Mr. I.P. Shepard of Waverly, NY presented a paper for the Tioga Point Historical Society in Athens, PA. In that paper, he created the following illustration with the help of Charles Henry Shepard, whose residence throughout a long life of eighty-seven years, was close to the hill and who remembered “distinctly” the “Spanish Ramparts” before the plow of a farmer nearly leveled them to the ground. 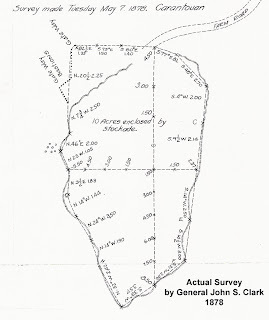 The information provided by Clark in the first portion of the survey (shown here) illustrates the cross section of the enclosure wall with the interior ditch clearly defined. 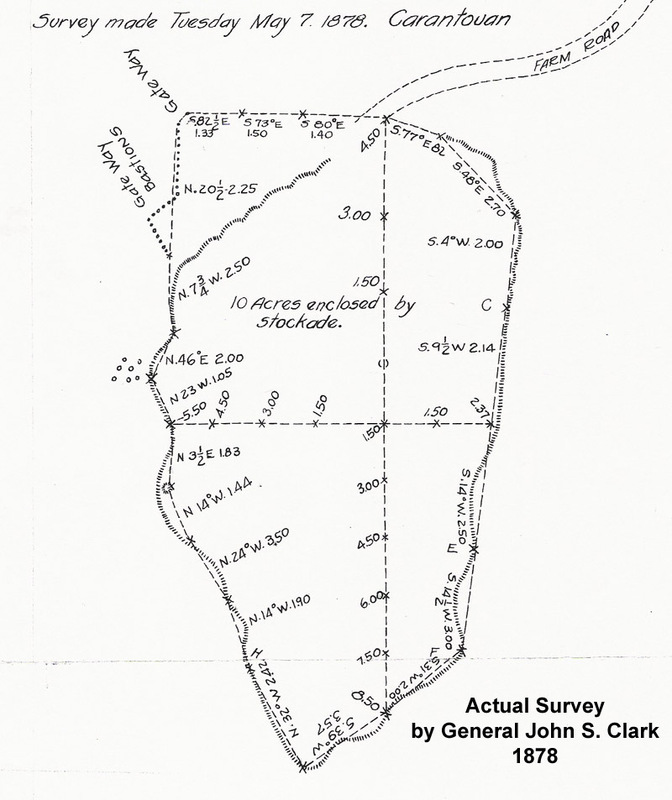 The second portion of the survey illustrates the massive size of ten acres that was enclosed running the entire edge of the summit. Why Clark placed posts in the embankment remains a mystery however, because no post molds were ever recorded to support this idea. Unfortunately, after the enclosure walls (as reported by early witnesses) were erased from the summit by annual plowing and cultivation, some researchers began to question whether they ever really existed at all. Furthermore, the researchers that did accept that the enclosure did exist would consistently deduce that they were indicative of an ancient hilltop/ palisaded village site. In fact, it wasn’t until the past decade when fresh eyes again reviewed these reports that any new discussions about the Spanish Hill site occurred. Specifically, the strange construction of the walls with the ditch on the inside of the wall became a point of interest, and when it was discovered in “Ancient Monuments of the Mississippi Valley,” that author and ancient mound specialist E. G. Squier wrote, “the circumstances of the ditch being within the vallum (wall) is a distinguishing mark between religious and military works” things began to point in a totally new direction to explain what Spanish Hill actually was. Like Fort Ancient – some believe today that the enclosure on top of Spanish Hill had been mistaken to be a hilltop fort, and was actually a ceremonial space. Fort Ancient is a name for a Native American people that flourished from 1000-1600 AD who predominantly inhabited land in the region of Ohio and Kentucky. The Fort Ancient culture was once thought to be an expansion of the Hopewell and or Mississippian cultures, but it is now accepted as an independently developed culture of its own. 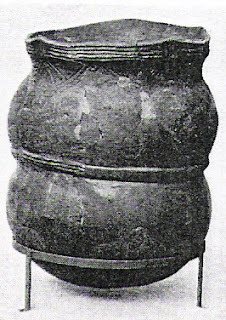 The name of the culture originates from the Fort Ancient, Ohio site. The fort is located on a hill above the Little Miami River, close to Lebanon, Ohio. Fort Ancient has earthen walls that are over 3 miles (5 km) long and up to 23 feet (7.5 m) high. The hilltop enclosure surrounds a plot of 100 acres (0.4 km). However, recently it was discovered that the southern “fort” was separately constructed much earlier than the much larger northern area of the site. 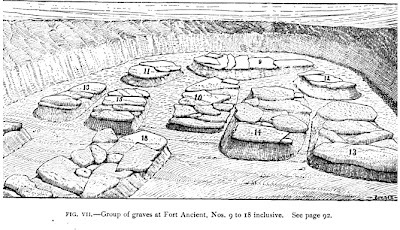 Despite its name, most archaeologists do not believe that Fort Ancient was used primarily as a fortress by either the Hopewell or the Fort Ancient -- rather, it is becoming commonplace to accept that it was a ceremonial location again due to the construction of the ditches on the interior side of the enclosure walls. 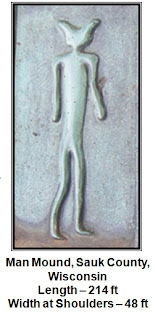 The Fort Ancient people are also given credit for the largest effigy mound in the United States, Serpent Mound, in Ohio, and are believed to be responsible for hundreds of effigy burial mounds in the shape of birds, animals, and even “horned men effigies” found in Wisconsin, Minnesota and Iowa. Until recently, it has not been commonly accepted that the Fort Ancients would have populated the regions of Pennsylvania but more and more evidence is mounting along the Susquehanna River that seems to be irrefutable. Sadly over the past two hundred years – the majority of the earthworks recorded by 19th century researchers like Squier and others have been demolished. Many in fact would be amazed to see the 1881 map of “Ancient Earthworks East of the Mississippi” created by Cyrus Thomas on behalf of the Smithsonian Institute to record the sites that even then were disappearing at an alarming rate. Dots pepper not only the Mississippi River Valley but also New York and Pennsylvania. In fact, Spanish Hill was included in the 1881 map and was recorded as an enclosure. Sadly, without the archaeological evidence of the enclosure atop Spanish Hill to accompany the historical records that remain, professional’s interest in the site has diminished, and as a result it is now private property with no access allowed for any research to continued. Yet even with the demise of the ancient earthworks over the last century and less and less hard evidence to support their existence, some researchers have found new hope in yet another type of evidence. Ancient rock art has been found which many believe irrefutably reinstates the belief that the Fort Ancients had a presence along the Susquehanna River. 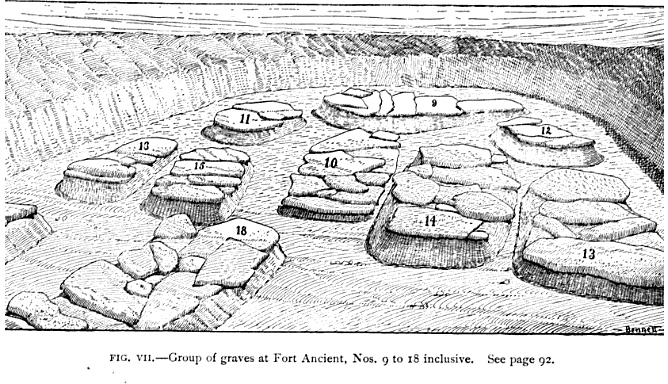 Below is a collection of effigy mound shapes, all found in just one county in Wisconsin. Below is a collection of petroglyphs found along the Susquehanna River in Pennsylvania at Safe Harbor. Copies of the ancient petroglyphs on a gneissic rock named “Little Indian Rock” below the dam at Safe Harbor, Pennsylvania, drawn from plaster casts by Professor Porter in 1863 and 1864. One of the most interesting and unique Fort Ancient mounds is the Man Mound in Sauk County, Wisconsin that measures 214 feet in length and 48 feet in width at the shoulders. Sites other than Safe Harbor have also shown evidence of the Fort Ancient water panther and belief system in Pennsylvania. The rockart/effigy shown here was found near Clarion, PA along the Allegheny River, and is commonly accepted to be a water panther or water spirit of Fort Ancient origin. Were the Fort Ancients in Pennsylvania and the Likely Creators of the Earthworks on Spanish Hill? Interestingly - these same type of stone graves have been found below Spanish Hill, and that info (with photos) have been reported to me by SRAC's own Ted Keir. During Moorehead's expedition in 1916, his crew actually found a Fort Ancient pot in the Murray Farm site which is just a stone's throw below Spanish Hill, which was reported by PA's authority on pottery, Charles Lucy in 1951 as, "a double pot grit tempered, and decorated in cord-wrapped paddle designs on the rim and neck. It is similar to specimens found in the Ohio Valley and identified as Fort Ancient..." This pot went with the rest of the artifacts from that expedition to the Heye National Museum of the American Indian in NYC which was just breaking ground in 1916. Moorehead's "Susquehanna River Expedition" was funded by that Museum's founder, George Heye in return for all of the artifacts and skeletal materials found or bought during it. The artifacts preserved today are quite sparse compared to what was found in Moorehead’s day, but there are ongoing efforts to preserve what can be located in order for more research to continue. This research has been an ongoing passion. I began chronicling the research on SpanishHill.com in 2003, which lead to an article being published in the PA Archaeologist Journal in 2005. In doing the initial research on Spanish Hill for that article, it became evident that just as with the earthworks, the artifacts are slowly disappearing because of constant artifact collecting in the region by private collectors. the region. SRAC also has a list of professional archaeologists and anthropologists from NY state and surrounding universities act as professional advisors allowing SRAC to continuously remain up-to-date about new finds, excavations, and research. SRAC is committed to maintaining a line of open communication between professionals and avocationals by sharing important information openly between the two. (The ongoing differences between professionals and collectors often make communication difficult.) As a result of these efforts, SRAC has been able to save artifacts that were found at Spanish Hill over a century ago, like the deep grooved ax shown here which was found by a private collector in 1897, and the blue slate amulet seen here, found in 1908. To date SRAC houses thousands of local artifacts from sixteen different private collections with many artifacts originating from Spanish Hill; in fact, one whole case is dedicated to that site and it’s the most popular part of the exhibit area. The Center is a 501c3 with over 300 members and is open five days a week while being manned 100% by volunteers, many of which are collectors and students of the regional Native American past and archaeology. The next step for the Center is to facilitate research with professionals and amateurs working together to start answering many of the questions surrounding Spanish Hill. The questions concerning the earthworks that once enclosed ten acres at its top, and the people who made them still need definitive answers. 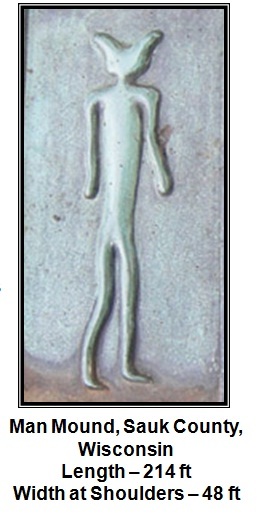 It is crucial that ongoing research continue in order to establish that the petroglyphs described here are of the same cultural origin as those earthworks recognized by Squier. In doing so, many answers to the questions of early Pennsylvania and New York and possibly Iroquoian prehistory may be uncovered. Researchers with backgrounds in Fort Ancient work are invited to join the ongoing investigation. For more information concerning Spanish Hill, visit www.SpanishHill.com. Please note: Spanish Hill is currently private property and trespassing is not advised. SRAC is located at 345 Broad Street in Waverly, New York. To learn more about this article and SRAC, visit www.SRACenter.org or contact Deb Twigg at dtwigg@SpanishHill.com. Thank in advance for whatever you can do! Visit the Susquehanna River Archaeological Center at 345 Broad Street in Waverly, NY! Jewelry and Beading Class January 7th at SRAC! Copyright SRAC. All rights Reserved. . Simple theme. Powered by Blogger.